Did you know that, in a way, Martha Stewart put me on my track to becoming a blogger? 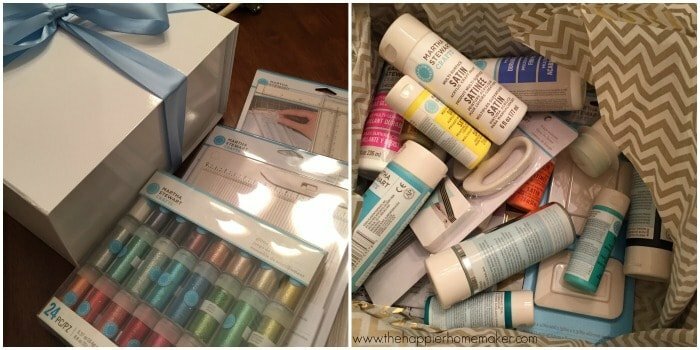 I always loved crafts growing up but after college, getting married and starting our family I just lost my mojo. Life just got hectic and creativity was placed on the back burner, has that happened to anyone else? When I was pregnant with my second son I caught an episode of the The Martha Stewart Show and saw her making embossed holiday cards. I was inspired to try it myself and it sparked me to really dive into papercrafting. When I was pregnant with my third son I turned from papercrafting to DIY and this little old blog was born and eventually became a “real” career for me! 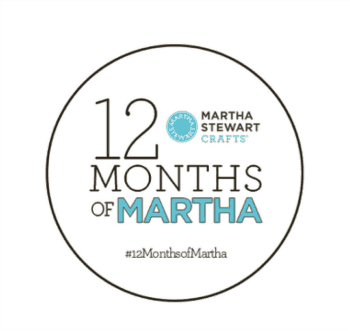 So you can see that obviously I have a lot to thank dear Martha for….which is why when I was asked to join some amazing bloggers to be an official #12MonthsofMartha blogger for 2015 I jumped all over the chance! Each month this year I’ll be bringing you an amazing craft or DIY project inspired by and created with Martha Stewart craft supplies! 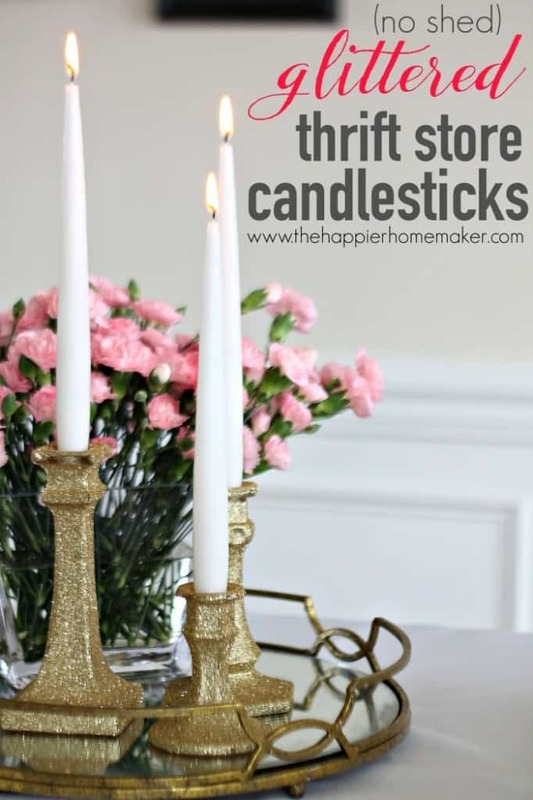 This month I am once again indulging in my love for all things sparkly with these easy to make, no shed, DIY glittered candlesticks! First, I highly recommend you prepare your work area-we all know that glitter shows up everywhere after a glittering project so I protected my workspace with a large sheet of newsprint-you could also you a baking sheet to contain the mess-this is a larger project so glitter will spread around! 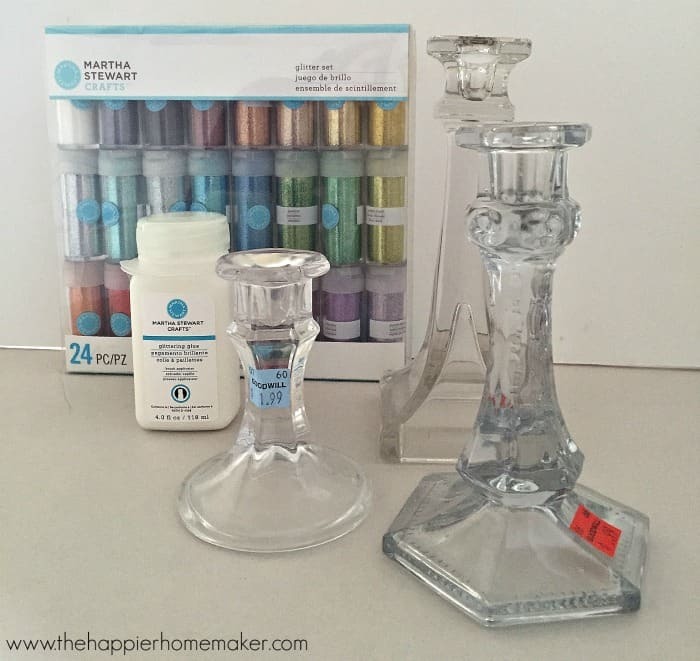 Clean your candlesticks if necessary. 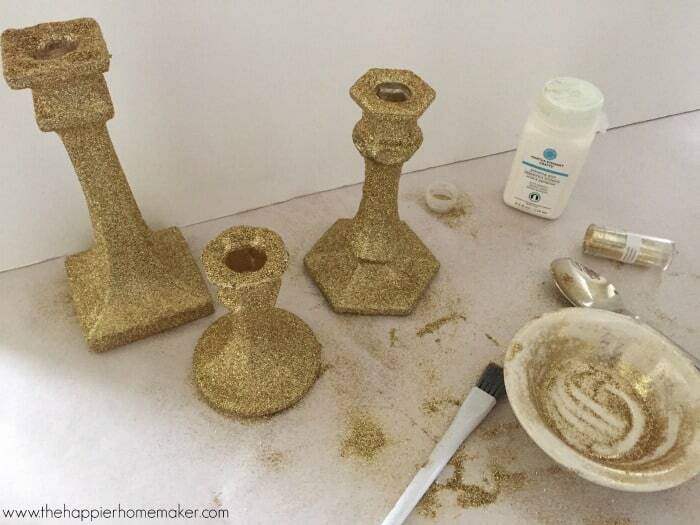 Place your glitter in a bowl and use the built in brush in the glittering glue to paint on an even light coat of the glue onto your candlestick surface. 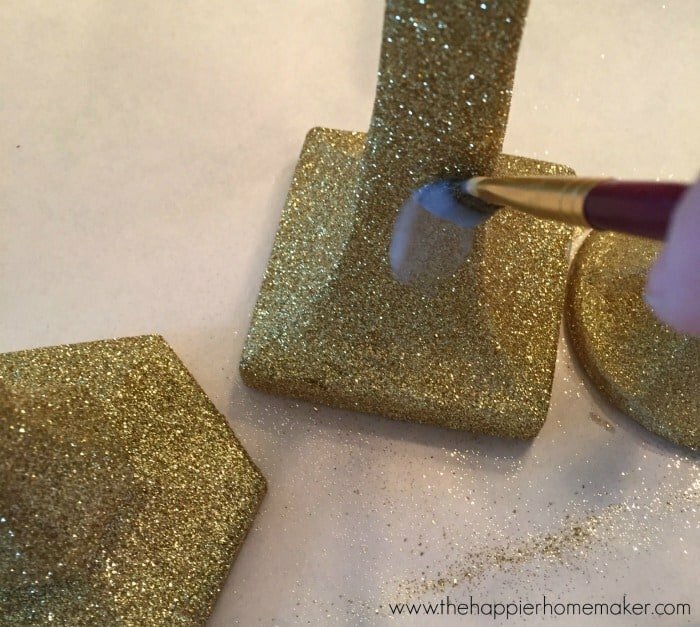 Work quickly so the glue doesn’t dry before you add the glitter. 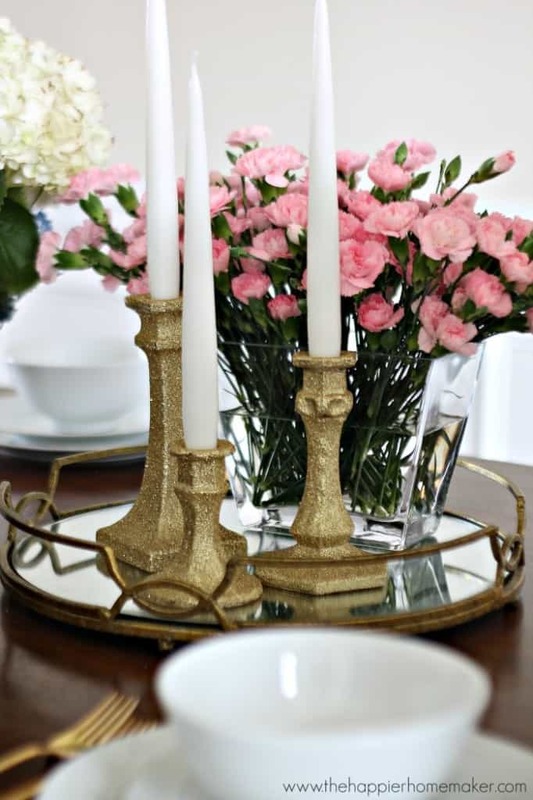 For larger pieces like these candlesticks it’s best to work in sections. 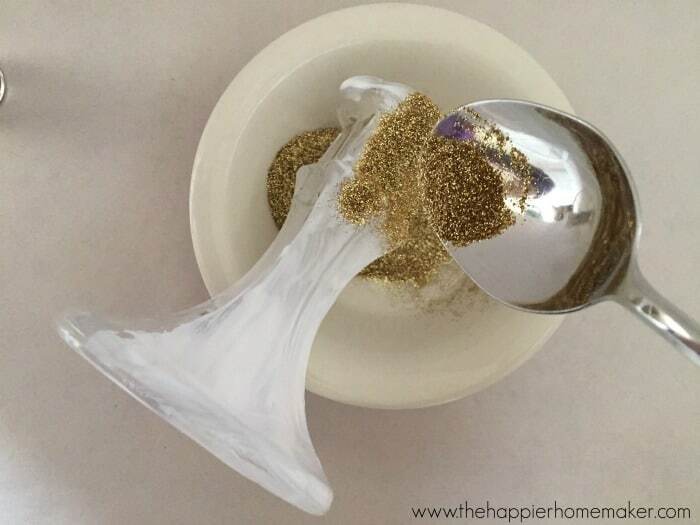 While they look pretty now, if you don’t continue to the next step you’ll have glitter everywhere each time you handle them-the key to preventing the glitter from shedding is to add a special coating on top! 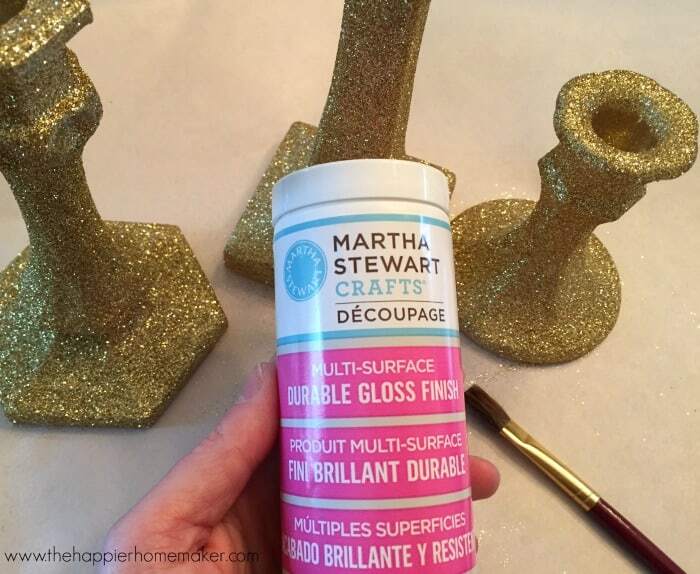 Allow the glue to dry completely (about 30 minutes) and then break out your secret weapon: Martha Stewart Multi-Surface Durable Gloss Finish! 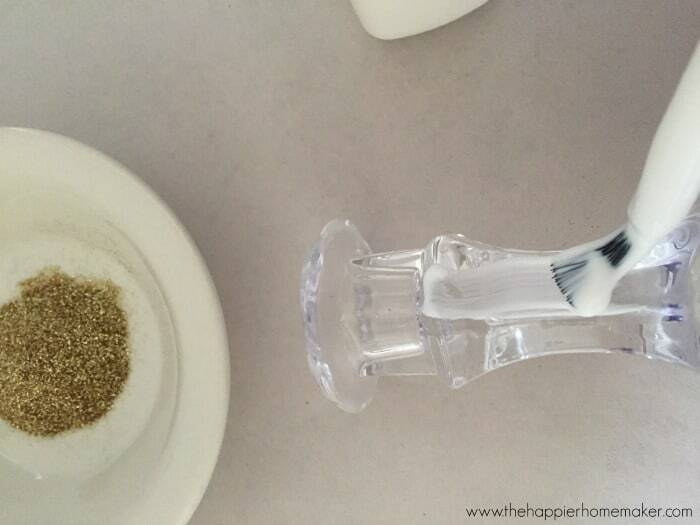 Use a paintbrush to brush on a thin coat of the finish over the glitter. Allow to dry thirty minutes and repeat, continuing until you have 3-4 coats. It’s important that you use multiple thin coats to prevent a dulling of the glitter. Patience reaps success people! 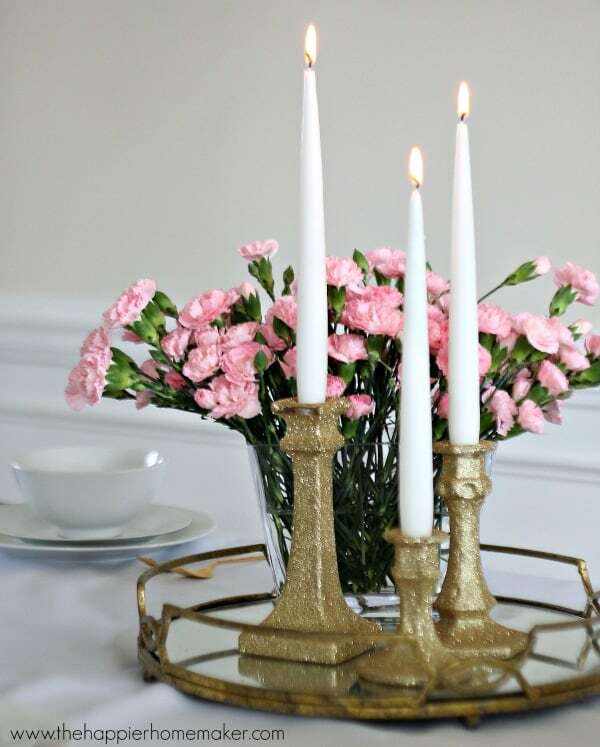 I think the candlesticks turned out beautifully, and they were the perfect cure to a dreary winter day for me! 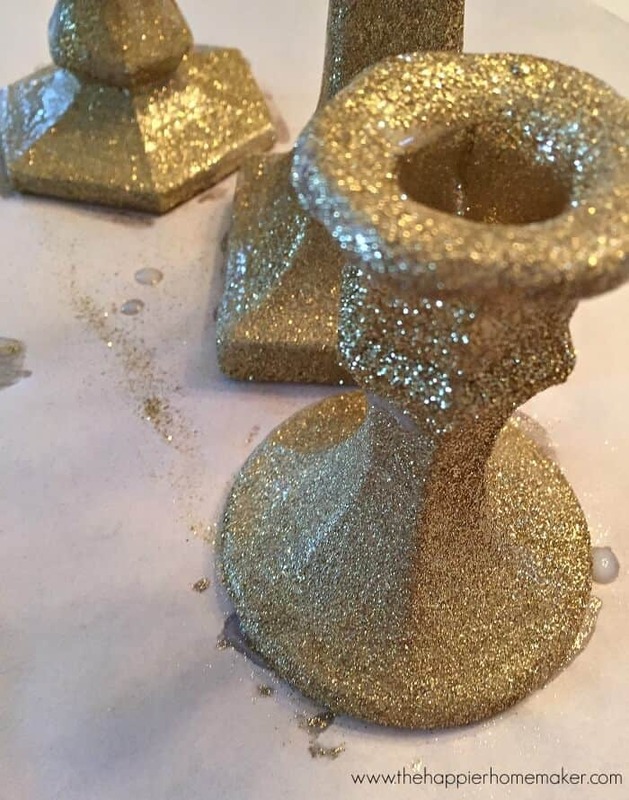 Are any of you as obsessed with anything gold and glittery as I am? I swear, I’m always looking for things to add glitter to lately! Disclaimer: I received a box of craft supplies to use, all opinions and glitter obsession is my own.